I can’t believe September is over and we are almost half way through October. 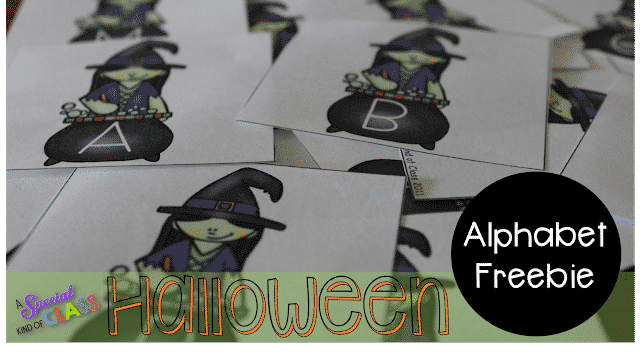 Halloween is just around the corner and we have been focusing on the alphabet in my kindergarten class since school started. Special education students need lots of practice, in lots of different ways. Now that they are beginning to show more confidence in their letter knowledge and most of my students are picking up on more and more letters each day, it’s time to focus on the difference between the upper and lowercase letters. We talk about why there are upper and lowercase letters and when is the appropriate time to use the uppercase version. Which is NOT in the middle of their name, or in the middle of any other word for that matter. I created this little freebie to work on a couple things because, as I mentioned above, my students need lots of practice in a variety of ways to be able to show their mastery of a task. Using the same materials in different ways allows me to cut down on prep while making the most of the materials I have on hand. I make several copies of these alphabet cards and laminate them. You don’t have to but I find they last much longer and I’m not having to reprint them each year. The first way I use these alphabet cards is for matching letters. This freebie has both the upper and lower case versions of the letters. 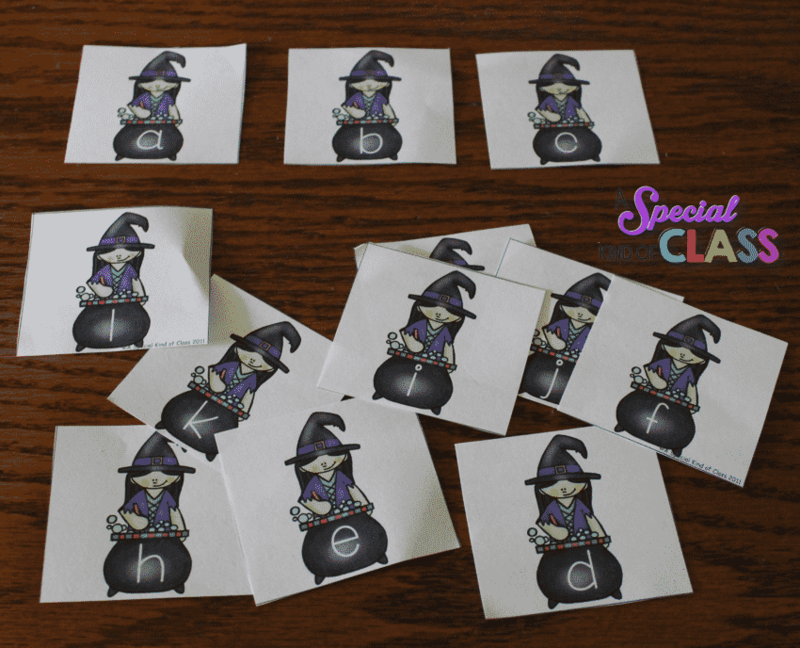 After demonstrating to the students what to do, I place the cards in my literacy center and see if the children can match the upper and lowercase letters. Often I will see a group of two or three students working together to see if they can get them all. 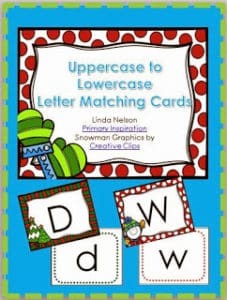 If you have a child that is working on basic matching or who may not know all the letters yet, you could have them match the lower to lowercase or upper to uppercase letters as a simplified activity. 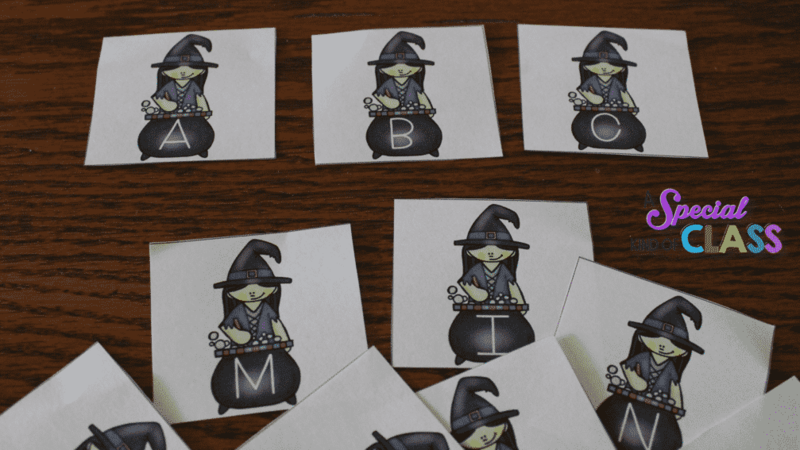 The next activity, I use for students that have a good grasp of the alphabet. I put one set of the cards at a station (either the upper or lowercase) and have them put the alphabet in order. This can be challenging for some students. Make sure you have an alphabet chart somewhere in the room for them to refer to. Lastly, for fun, I have my students play a matching game. Pick the letters you want to work on and place them face down on the table. 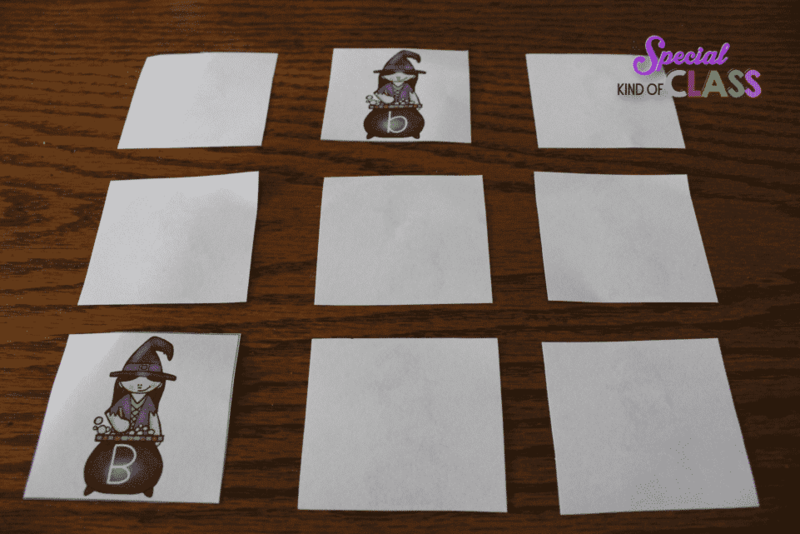 Have the student turn over two cards and see if they match. 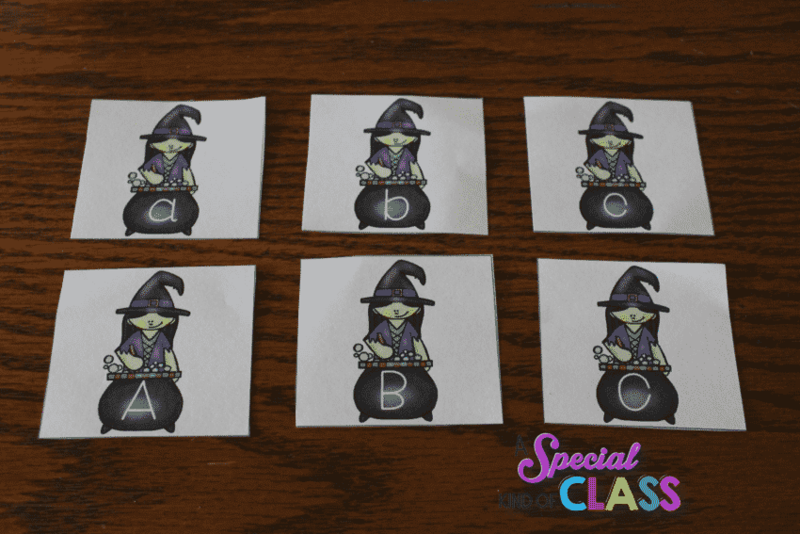 This game is perfect for students who get overwhelmed with all the letters showing at once. It’s also a great game for working on turn taking and waiting. Depending on the level the children are working at, I have done this with matching lowercase to lowercase, uppercase to uppercase and uppercase to lowercase. I am sure there are many more ways these cards can be used in the classroom. As Halloween gets closer, I hope you find them useful. Students always respond better when they don’t realize that they are learning. Click on the picture below to grab this free set from my store. Still need some free Halloween ideas? 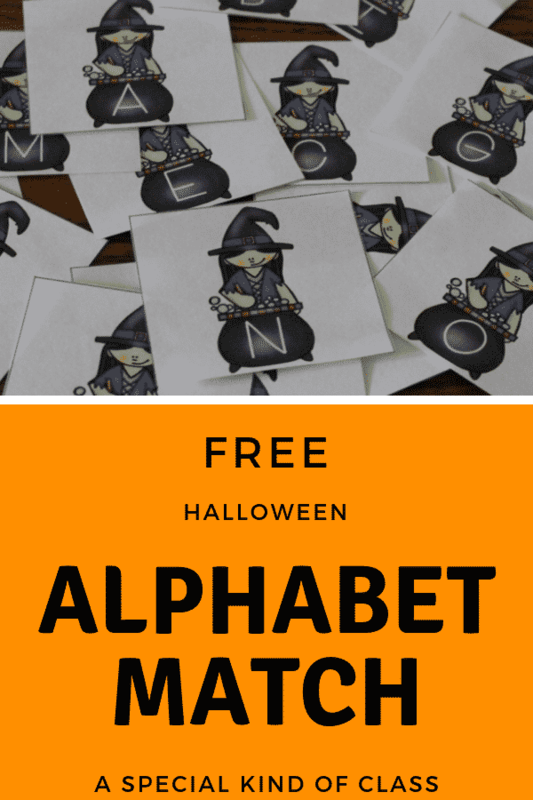 Here’s another Halloween freebie from a great classroom freebie author. I am a teacher, blogger, teacherprenuer and hockey mom from Ontario, Canada. I have been teaching special education at the kindergarten level for over 27 years. My specialty is working with children with physical and speech disabilities. I have written curriculum and given workshops on how to adapt materials to reach all children, regardless of their ability to speak.